be interested in becoming members of the local section (MBS). educational development of its members and dissemination of information concerning all aspects of the wastewater/water environment industry. The CWEA provides opportunities for professional growth through industry conferences, certifications, and legislation: it joins other professional associations, and recognizes professional accomplishment through awards for distinguished service. The CWEA is divide into 17 local sections to make administration and organization of the state more manageable. This allows for improved sharing and passing of information to local industry and communities. 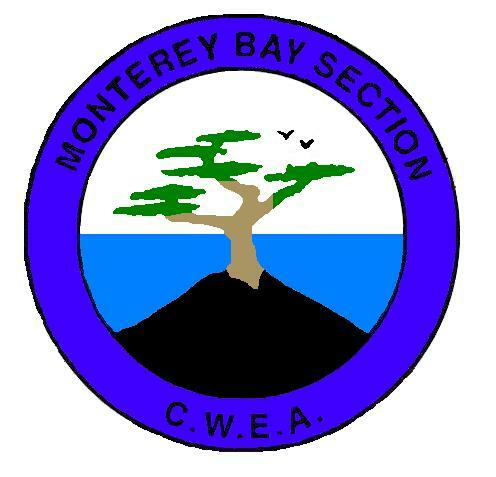 The Monterey bay section (MBS) comprises one of the 16 local sections of the CWEA. The section covers a regional area encompassing Monterey, Santa Cruz, San Benito counties, plus the portion of Santa Clara County south of Coyote. The mission statement of the MBS is “to enhance the education and technology to protect the quality of our water resources and to promote the ecological balance with the environment’s other resources such as land and air.” The MBS accomplishes this goal through two main avenues. Regularly scheduled meetings (6/year) every other month between members within the section boundaries, and through publication of a newsletter. By supporting our organization through membership, the MBS can provide you access to a large constituent base and wide regional area along with important state and local information, which shapes the wastewater industry. Included in the Newsletter are MBS meeting announcements. Each meeting features a guest speaker on varied topics of concern to the wastewater industry.